There is not much to add about Hanna's structure. It's going to be like watching grass grow in the short term. The structure is still disorganized, but should become tropical again and probably become a hurricane before landfall. The models are still pointing to the Southeast U.S. around Thursday or Friday. The farther south, the quicker the landfall time. 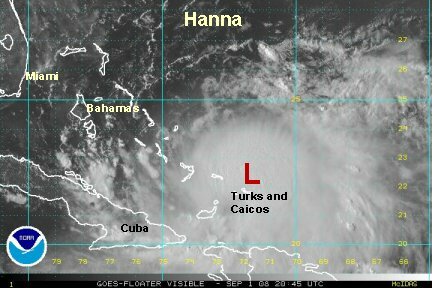 Interests from Florida's 1st coast to the North Carolina Outer Banks should follow the progress of Hanna. In the last update we made the comment about watching Hanna will be like "watching the grass grow". Well, it looks the grass is growing pretty fast. After two days of being in disarray, it is now looking tropical again with a large burst of convection over the center of circulation. NHC changed from making it a hurricane before landfall to now just a storm. Since that last forecast, the burst of convection has started. They may make it a hurricane again. Part of the problem has been Gustav to the west injecting some unfavorable winds aloft toward Hanna. The intensity forecast will be tough. The track has not changed much. Thursday or Friday in the Carolinas somewhere. Still be prepared from Florida's 1st coast to the Outer banks of North Carolina. We would like to see a good 24 hours of model runs to confirm where it's going. 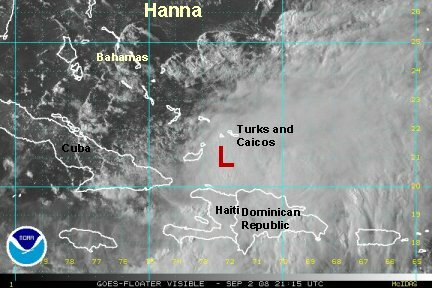 Hanna's satellite appearance continues to improve. In fact, cloud top are higher than with Gustav. There is a huge burst of heavy rain north of the Turks and Caicos associated with Hanna. Northerly winds are also apparent on the satellite north of Hanna. 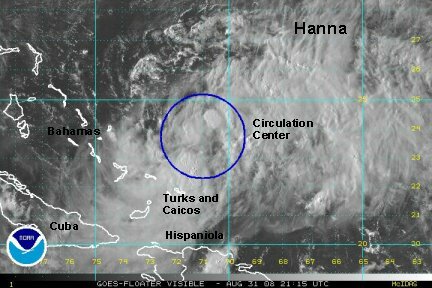 It seems as though Hanna is strong enough to fight the wind shear. NHC did decide to change their forecast back to hurricane strength before landfall. The track still take Hanna northwest toward the Southeast coast by later Thursday or Friday. The more reliable models (and NHC) have landfall in South Caroliina near Hilton Head. Keep in mind, that the landfall position could easily change and that the models bring Hanna close to the coast in northeast Florida. All interests on the northeast Florida coast to North Carolina should continue to follow Hanna. The satellite imagery shows very cold cloud tops over Grand Turk and surrounding islands. The most recent recon measured a 986 pressure with a surface wind of around 60 mph. A buoy measured seas to 20' east of the Bahamas a short while ago. Seas may already be 25'+. It looks as though an eye is slowly trying to evolve near the Turks. With this being the case, Hanna should become a hurricane within 12 hours if the trend continues. The models are steady taking it to near Hilton Head by Friday. It will be very close to the northeast Florida and Georgia coast Thursday too! 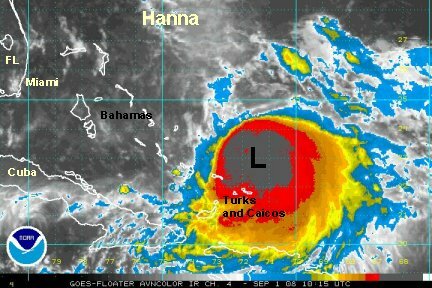 Interests from Florida to North Carolina watch Hanna closely. 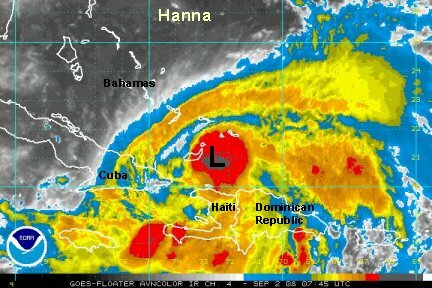 It didn't take long from our previous post to see Hanna upgraded to a hurricane. The satellite presentation really doesn't look any different from a few hours ago. The recon now has the pressure down to 983 mb. It found a 64 knot wind a few hours ago, so that's the reason for the upgrade. Since then, the winds have been a bit weaker. In reality, Hanna is probably a 65-70 mph tropical storm still. The models haven't changed much. The hwrf brings it up the Savannah valley Friday after brushing the north Florida coast the day before. The last recon measured a wind of 90 kts at 850 mb. That's about 104 mph. Unfortunately the Hurricane Hunter did not have a surface wind report, so the wind is extrapolated from what was found at 850 mb. Pressure hasn't changed much - around 983 mb. That's in the range of a borderline hurricane. It will be interesting to see if that 104 mph wind was a down burst or actually representative of Hanna's strength. The buoys are not reporting much wind. The one closest to Hanna is only reporting a gust to 35 knots. Seas are around 18', but probably higher near the center. The satellite presentation hasn't changed much either. There are extremely high cloud tops, indicative of what would produce down bursts, by no eye. Usually by 80 mph you have an eye. The recon did not report one. Models still call for Hanna up the Savannah valley Friday after moving about 50 miles offshore of the northeast Florida coast the day before. 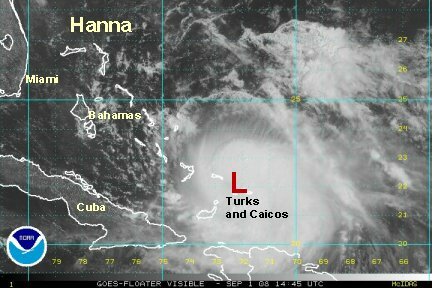 Hanna continues to spin north of the Turks and east of the southern-most Bahamas. It appears that very stormy weather is near Abrams Bay. The buoys have not changed much. If anything, the wave heights have gone down slightly to around 16-18'. They are also not reporting winds over tropical storm force except for an occasional gust. No new recon data is available at this time. Later this evening we should get new information to track it's strength. We''ll be watching to see if the winds still support 80 mph sustained or if the previous strong wind gust was from a micro burst. The forecasts have moved north a little. Now they are calling for a landfall between Charleston and Savannah on Friday. As we mentioned with Gustav, it is expected for the models to move around beyond three days. An exact landfall can not be pinpointed at this time, especially with Hanna stationary. Is the forecast up in the air now? It's tough to tell if the center reformed east of Great Ingaua or if the center drifted southwest. Either way, we need to follow this motion carefully for the next 12 hours. 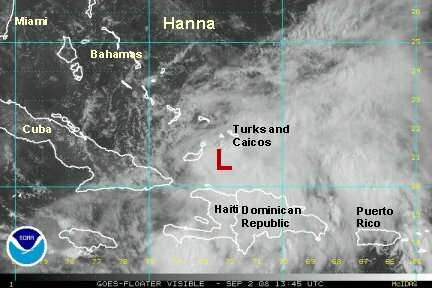 Hanna was expected to stall east of the Bahamas, then get picked up by the trough sending it into the Southeast U.S. somewhere. If this southerly trend continues, then a major monkey wrench has been thrown into the forecast track....one that the models did not pick up on. It appears that the northerly winds have pushed it south-southwestward. It this trend continues, it could end up in Haiti! We're not forecasting that, but we need to watch this carefully! The models still insist on taking Hanna into the Southeast. Currently a new burst of convection has started. Several hours ago, the convection collapsed. This meant that the winds definitely weren't 80 mph. Now that this new intense burst has started, winds have likely picked up again. Still no new recon, we believe that the next one is Tuesday afternoon. The southwestward jog has as we put it earlier " put a monkey wrench into the forecast ". With the current position east of Great Inagua and south of the Turks and Caicos, it will allow the approaching trough to pull it farther west. This now means that all of the Florida east coast is in play. The models keep it barely offshore, but it possibly will be close enough to feel the effects. A very strong high over the Gulf of Mexico coupled with an upper air low off of the east coast has produced northerly wind shear over Hanna. The northern half of Hanna is exposed so that the low level circulation is visible. 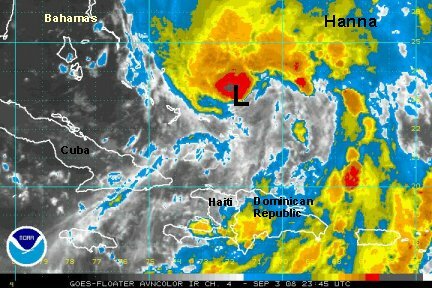 It appears that Hanna is holding on so that the convection is now rebuilding. We think that the 70 mph winds are too strong at this point. With the convection rebuilding around the core the winds should come back up soon. A recon is finally on the way back in. Be very careful in interpreting these charts. They are easily available to the public and very easy to misinterpret. Most people look at the middle of all of the tracks and think that would be the most likely course. Some models perform better than others. And as we have mentioned earler, the models can have <i>large</i> errors beyond three days and sometimes less. Some people actually pick there favorite color and follow that track! Hurricane Hunters have shown a slight southeast drift today.This means that Hanna has moved from just east of Great Inagua to south of the Turks and Caicos. 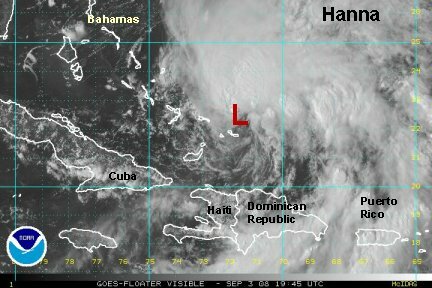 The upper air trough has taken a toll on Hanna and has weakened it some, down to 65 mph. The models have predicted a small drift to the east before the mid-level ridge builds back in. This should take Hanna northwest into the eastern Bahamas and then eventually past the Abacos. Models are still split on the ultimate landfall(s). The HWRF is the farthest west with a landfall near Cocoa and taking it up the east coast into Georgia. The GFS has Hanna farther east and takes it over the Abacos then into Charleston. The Euro agrees with the HWRF with a Cocoa landfall and up the east coast of Florida into Georgia. As NHC very appropriately says...a small deviation in the track will mean vastly different consequences up the coast. The water vapor is showing the slightest hint on the high building. When we see the trough to the north lift, then the turn begins. That's what we'll be watching for over the next few hours. The combination of a upper air high in the Gulf of Mexico and an upper low off of the Northeast U.S. coast have combined to nearly destroy the convection over Hanna's circulation center. With that being said, Hanna probably has top sustained winds of only minimal tropical storm force. The buoy closest to Hanna still had seas in the 35 mph range in gusts with seas near 14 feet. The wind shear is expected to weaken as a high well northeast of Hanna starts to build west. The forecast track is slightly farther east. Most models tend to favor the Carolina's at this time. The old run of the HWRF still had it paralleling the east coast of north Florida. We'll see if the HWRF gets in line with some of the other forecasts on the next run. The models still insist on restrengthening Hanna as it makes its turn to the northwest. This seems reasonable since the upper air winds should become much more favorable for development. Squall bands still <i>may</i> be close enough to the Florida east coast to produce rough surf conditions and heavy rain showers with gusty winds Thursday and Thursday night. The chances of this happening improves as you go farther north up the east coast of Florida and beyond. 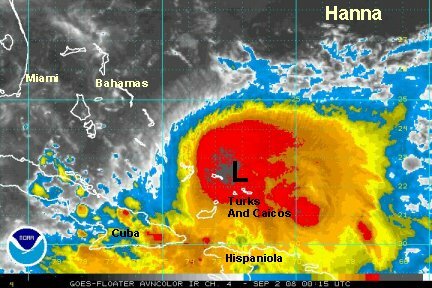 The Carolina's may experience the worst of Hanna with the weather going downhill Friday. First of all by strengthening we mean from about 45 mph. We think that the 60 mph is too high. A buoy in the vicinity of the heavy convection is only gusting to around 45 mph. So, we think Hanna is on its way to better organization and winds which that could be up to 50 to 60 mph by later the afternoon. The surface center is still ragged at this point. The models are coming in line. 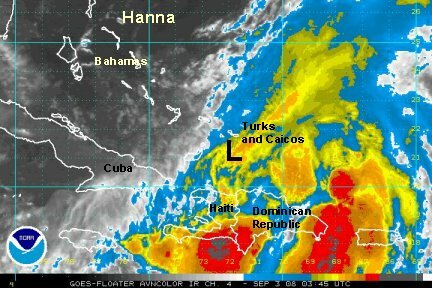 They take Hanna just east of the northeast Bahamas then toward the SC/NC border by Friday. The Florida east coast may have some gusts to tropical storm force late Thursday or Thursday night. Hanna should arrive in the Carolinas Friday. 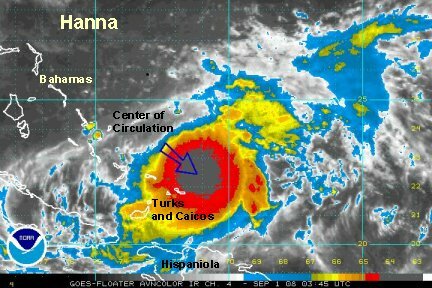 Hanna is east of Mayaguana (southeastern Bahamas) in the Atlantic. It is moving north and the pressure is slowly dropping, now at 990 mb. It looks like the center reformed today. 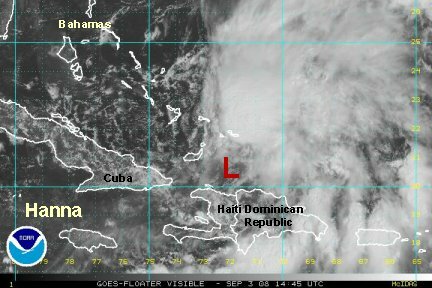 The surface low was south of the Caicos and a mid level circulation east of the southeastern Bahamas. That is where the surface low is now located. The satellite imagery shows the deep convection on the east and north side of the circulation. The west and south side are nearly void of deep convection. That is good news for Florida, which should miss the worst of this system, for the exception of an occasional band on the east coast. At this time it looks like the Carolinas will catch the brunt of this tropical cyclone. The latest models take it toward eastern North Carolina. Weather should go downhill in the Carolinas Friday with landfall Friday night. Again, by slow strengthening, we mean from our estimate. The recon nor the buoy's support 65 mph at this time. The closest buoy has a wind of 40 mph, gusting to 45 mph. The last recon roughly an hour ago had a 989 mb pressure and 40 knot surface estimate. So 50 mph is probably close to the actual sustained winds. The convection remains mostly north and east of the center, good news for Florida. The models are still mostly showing eastern N.C. as a landfall point Friday night. 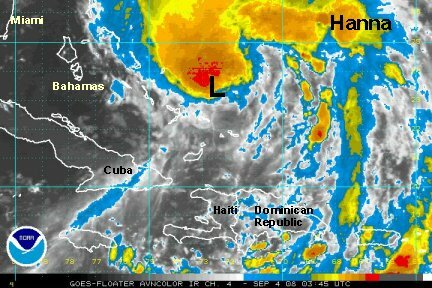 Hanna slowly continues to organize and move northwest just east of the Bahamas. We still think that 65 mph is touch too strong. The next recon is in progress. Buoy data east of the Bahamas indicate that seas have risen to 21'. Haiti and the Dominican Republic have been flooded again. This is the third time that those countries - especially Haiti has seen devastating flooding. The moisture from Hanna extends well south and more rain is possible. Nothing new on the forecast front. It still looks like a landfall in eastern N.C. Friday night. South Carolina will get effects also, especially heavy rain. The heavy rain is likely to soak the Mid-Atlantic and Northeast Saturday and Saturday night. Flash flooding will be a concern.